Cozy and Christmas just go together in my book! I love decorating our living room and porch for Christmas! A few weeks ago, I was part of a Christmas Home Tour where I shared only our dining room & sun room (read it, HERE). 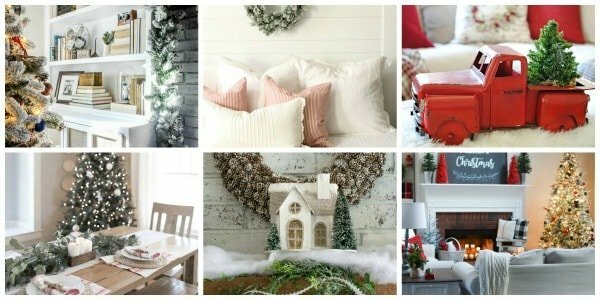 Come tour our cozy Christmas living room and porch! 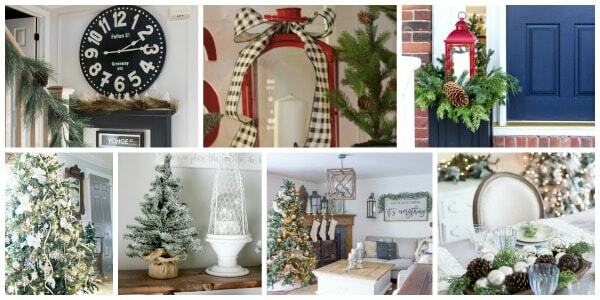 Today I am excited to be joining another group of talented bloggers to bring you part 2 of of my Christmas home tour. 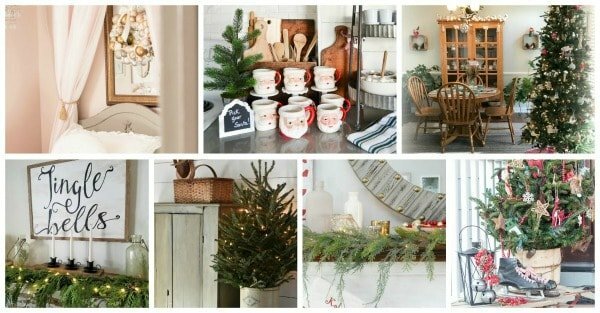 A huge shout out to Jenna from Wife in Progress for coordinating this Home for the Holidays Blog Hop :) If you are hopping here from Carol Bluesky at Home, WELCOME & how stunning is Carol's home? So much inspo! So let's get this tour started! Today I want to take you from our front porch to our living room! First up, welcome to our porch! I've said this before, but our porch was one of the major selling points when we decided to purchase this house. The porch is huge & we love spending time out here. In fact, we have celebrated many parties & events out on the porch because it can hold so many people! We love watching the sun set, drinking our morning coffee, & chatting with neighbors as they walk by out here. It is such a gathering place for us & we know we will continue to make memories out here. With our house being blue, I don't like to use much red out here because I think it would clash too much so I stick to whites & greenery. We strung up lights around the light post, the door way, & the vintage sleigh. The little flocked tree came prelit ( WIN! ) so that was an easy addition. Since we live in Buffalo, NY, it gets pretty cold here in the winter time so I don't go too overboard because we can't really sit out on the porch very often. I keep either side pretty simple, but I added a few flocked wreaths to the windows & door. I wound some flocked garland around the old fence posts we have leaning against the house & added a couple of vintage sleds to either side of the door. A simple, yet festive porch! Now that we have toured the outside of our home, let's move on inside & warm up in our living room! I was so excited to decorate our living room because we get a real tree & put it in here so it fills the whole room with such a pretty pine smell! I will start at the tree at the front of the room. The tree I kept pretty neutral with silver bulbs, burlap ribbon, & some heirloom looking crocheted Christmas tree ornaments from She's Rooted. Moving onto the fireplace, I layered lots of greenery & garlands, added some red berry stems, birch trees from my favorite local antique shop, The Tattered Tulip, little houses, & twinkle lights! We got new stockings since we added Dominic & Freddy to our family this year!! They are a classic red, which I love & we will be able to use them for years to come! Now looking to the back of the room, I added some fun texture with the wood stick wreaths from The Tattered Tulip. I created a little forest in the back corner with some different faux trees & added this gorgeous, Thrill of Hope sign from Oh Sweet Skye. She is so kind & is offering your 15% off of this sign in her shop using code ARATARIATHOME. I added some tree trimmings to the cotton wreath on the antique gate & put some more red berry stems in my galvanized wall hangers. For pillows, I used my classic white ones & added some fun red ticking stripe pillows from Flat Creek Farmhouse, wreath pillows, & a plaid pillow. I wanted the room to feel cozy & pretty traditional. I don't use too much red, but did add some pops of it to give that traditional vibe. This room is where we spend the majority of our time so we get to enjoy the glow of lights every day! I hope you enjoyed our home tour! I just love this magical time of year! Life seems to have more meaning during the holidays & I love creating a warm & inviting home for our family. This year's Christmas will be extra special with Dominic being here! 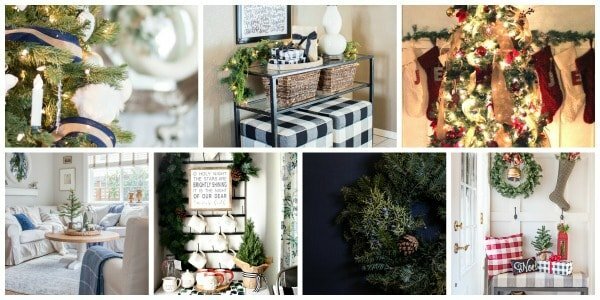 Please be sure to continue on this Home for the Holidays Blog Hop & visit Little House of Four to check out her gorgeous home! Below is a complete list of all the bloggers participating in this hop so check them out for tons of inspiration!